It’s dangerous to assume than you simply purchase your shotgun, place it in the closet, and then tell yourself that you’ll be ready when you hear the “bump in the night.” There are effective and proven means to evaluate your shooting technique, learn and practice new techniques’, and elevate your game. It’s called TRAINING! At ONE on ONE Firearms, our world revolves around shooting. Over the years and the hundreds of classes we’ve taught, our curriculum has evolved into a streamlined system. In a short period of time, new shooters can go from having almost ZERO shotgun skills, to a level of competence far beyond the skill level of the average shooting enthusiast. That's not to say the experienced shooter can't benefit from this class. It can be a great opportunity to validate your current technique, identifying any bad habits or training scars that you might have developed over the years. We can help any shooter make the transition to a more efficient and effective modern shooting technique. 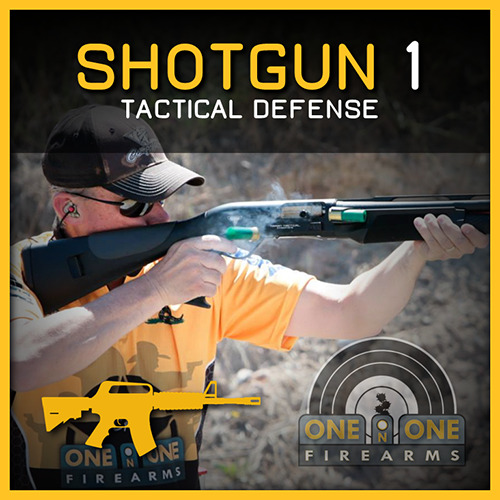 Shotgun design, nomenclature, action types and selection for home defense. Ammo pouch, dump bag, shell caddies or even cargo pants with large pockets etc.